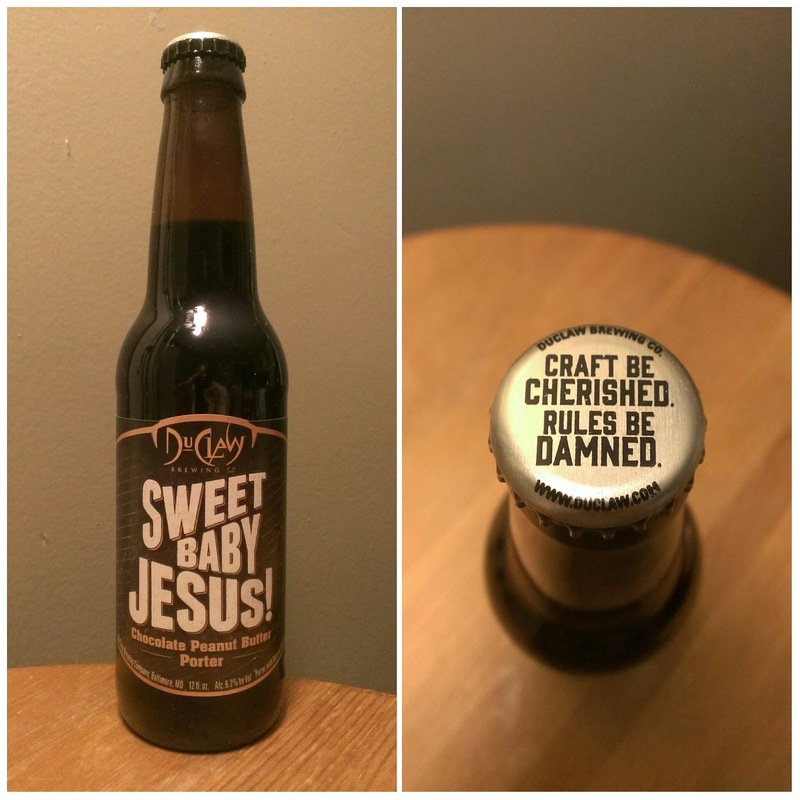 John's Beer Blog: 1/21/16: DuClaw Brewing Company's Sweet Baby Jesus! 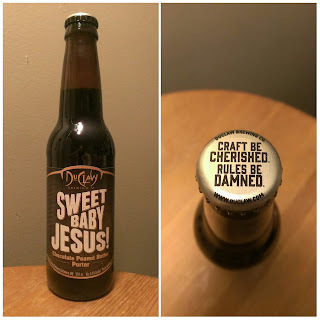 1/21/16: DuClaw Brewing Company's Sweet Baby Jesus! Before, oh, say summer of last year I had never heard of DuClaw Brewing Company. It was only when I started seeing articles about how Sweet Baby Jesus! 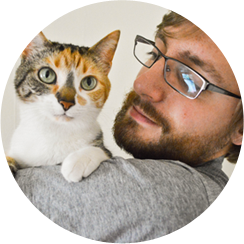 was being pulled from grocery store shelves for its "controversial" name. And, even then, all I really knew was the name of that specific beer, not the company producing it. It wasn't until I visited my family just before the holidays that I actually tried the stuff. My dad, who is much more financially stable than I am ever likely to be, saw the chocolate peanut butter porter and, not sweating the price too much, decided to go ahead and purchase a sixer. The lucky thing here is that he decided to share some with me (and even gave me a few bottles to take home). I've had my final bottle queued up for review for quite some time. Although I have my initial impression of the beer, I'm excited for the opportunity to sit back and give it the proper John Likes Beer review treatment. DuClaw was begun in similar fashion to how many of my favorite breweries were: with a strong passion for making beer. The brewing company's About page details how founder Dave Benfield started homebrewing in college. From there, and after a brief stint working for his parents, he struck out to open a brewpup in 1995. Since then, DuClaw's operation has grown astronomically from their humble Maryland roots (now they can say that stores in Ohio hate their product! ), but have stayed in their home state. I'm not the hippest on "cool," although I definitely think DuClaw lives up to their mantra of coolness, but a quick look at their beer list shows that the brewery definitely has firm grasp of the concept of wow factor. Clicking the appropriate link on that beer list will take you directly to the Sweet Baby Jesus! page, which informs that the 6.2% ABV porter was brewed with two kinds of hops and a handful of malts. The pages tells of coffee, chocolate, and peanut butter notes and "...a luxurious mouthfeel." Given that the brew is, in fact, a chocolate peanut butter porter, I expected those elements to be front and center, in both the nose and the taste. You know what? I have to hand it to DuClaw. This is all chocolate and peanut butter in aroma. The chocolate is more prominent, but there's peanut butter to be found in the back. There's also a coffeeness mixed into the chocolate part, which must be why Purrl only gave it one whiff--cats, in case you didn't know, generally hate the smell of coffee. That hand I'm giving DuClaw in the aroma department extends down the line into the flavor territory. Remarkably, Sweet Baby Jesus! tastes exactly like how it smells. This is a win in a big way. Upon taking a swig, your mouth will be hit with an immediate one-two punch from chocolate and coffee fists, with a little jab of peanut butter thrown in for good measure. There is a mild bitterness floating around in the porter from the utilized hops, but that does nothing to detract from the decadence of the brew. Remember when I quoted that the brewery describes Sweet Baby Jesus! 's mouthfeel as "luxurious?" Yeah? Well, here's more good news: That description is spot-on. It's full and rich. You can feel the weight of each swig without being weighed down by it. Good on you for that astute observation, DuClaw. This porter, honest to goodness, reminds me of the first time I had Reese's Puffs. I was a preteen (a fancy of saying around eleven-years-old). I'd seen the commercials for the stuff on TV for years. I always thought: "Are you kidding me? Reese's for breakfast? Chocolate and peanut butter for my morning meal? Sign me up!" With enough pleading, I was finally able to convince my mom to buy me a box. And I loved it. I didn't mind that it was essentially Peanut Butter Crunch with cocoa powder slathered over some of the cereal bits. It was chocolate and it was peanut butter and it was good. All I've done this review is sing the praises of DuClaw's Sweet Baby Jesus!, which might make my final score of the brew seem strangely low. That score, by the way, is a rock-solid 9.0/10. It'd be higher if I hadn't tried SBJ's sister beer the last time I was at my parents'. Now I'm spoiled. 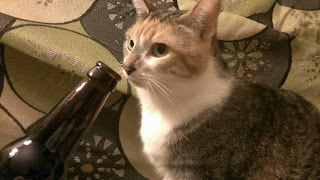 That sister beer, by the way, is For Pete's Sake! and I hope to review it one day soon. Until then, please drink Sweet Baby Jesus! and let yourself wonder how great that beer must be.